Bathe your way to younger looking skin with Calgon! 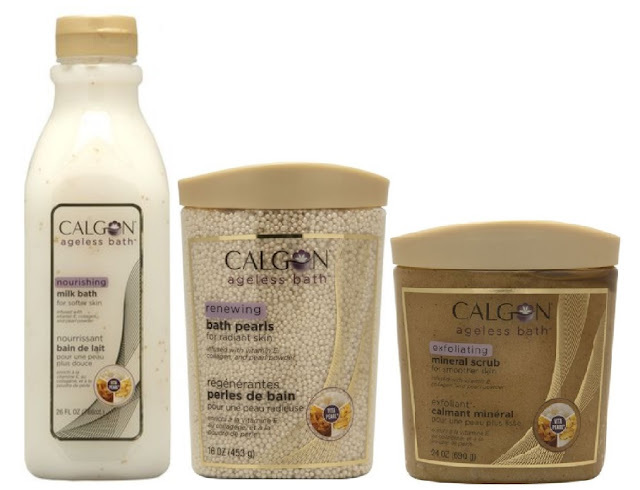 Take aim at aging skin below the neck with Calgon Ageless Bath - a line of bath products infused with an exclusive Vita-Pearl technology with pearl powder, vitamin E and collagen. Nourishing Milk Bath - 766ml - $6.99 - a nutrient-enriched, nourishing and foaming milk bath that features moisturizing serum beads - you can actually see the appearance of dry lines diminish after one use - for skin that feels soft, smooth and comfortable all day. Renewing Bath Pearls - 453g - $6.99 -. step out of the bath with a youthful glow after taking a soak in a formula that provides luminosity and moisture to the skin - dullness is immediately brightened for skin that looks younger and fresher. Exfoliating Mineral Scrub - 690g - $6.99 - scrubs away signs of aging as it exfoliates dry, dead skin cells leaving skin smooth and even toned. You can use them separately but I like them all together - the bath pearls are great from brightening but they don't bubble so add the milk for softness and foam - once in the tub slather on the scrub and let the water just soak it away - it won't make the water gritty but it sure will make your skin smooth!